Melasma, also known as chloasma, is a the patches of brown to black pigmentation that occurs on the sun-exposed areas of the face. It is a very common condition in women and is more frequently associated with hormonal changes. However, it also occurs in men although rarely. Melasma is known by several names in different languages but is commonly referred to as hormone / pregnancy / menopause pigmentation. In the past it used to be referred to as the veil or mask of pregnancy. The term chloasma is considered to be outdated as chloas– was derived from the Greek word for green, whereas melas– refers to the color black. Melasma occurs almost exclusively in women with only 5% to 10% of melasma cases occurring in men. It can affect any race group but is more common in darker-skinned individuals with a more light brown skin. The age groups that more likely to be affected varies but it is more commonly seen in women in their reproductive years and menopause and typically in the 30s to 40s. Women who live in areas with intense sun exposure are also more likely to be affected. The exact reason why melasma occurs is unknown although several risk factors have been identified. While sun has not been conclusively proven to be the sole cause, it serves as an important mediating factor for the ongoing development of irregularly shaped patches on the skin of the face. There is an increase in melanin – the pigment that is responsible for skin color. The number of melanocytes (cells that produce melanin) and melanosomes (melanin-containing organelles) are also increased significantly. It has been postulated that the development of melasma is a combination of factors including the influence of hormones like an estrogen and inflammation caused by sunlight damage. Gender. Women are more likely to develop melasma. Family history. Melasma is more likely to occur in women with a strong family history. Hormone. Melasma is more likely to occur during pregnancy and with the use of oral contraceptives. There is also evidence to suggest that progesterone administered to postmenopausal women may also play a role in the development of melasma. Apart from the female hormones, it appears that thyroid gland disorders may also be a risk factor for melasma. Sun exposure. Melasma is also more frequently seen in women living in areas with intense sun exposure. Cosmetics. Certain cosmetics and toiletries, particularly strongly scented products, may also be a risk factor in association with sunlight exposure (phototoxic effect). 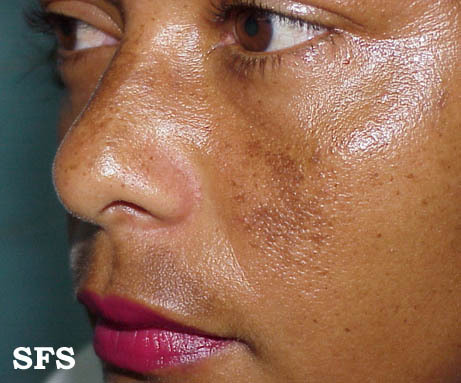 Skin lightening creams (whiteners) and other skin applications containing hydroquinone can cause a blue-black staining of the skin on the sun exposed areas. Any systemic or topical agent that may make the skin more prone to sun damage may also be considered as a risk factor. Skin disorders. 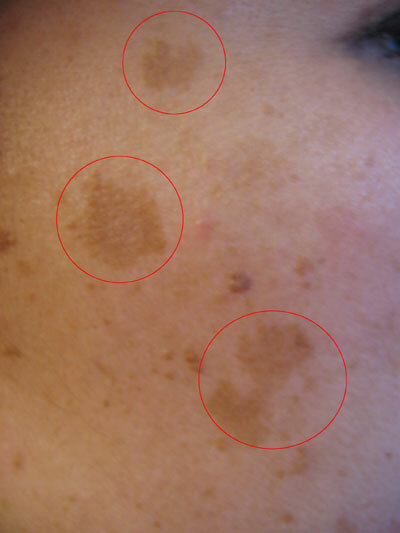 Melasma is also more frequently seen with melanocytic nevi and lentiginous nevi. Idiopathic. 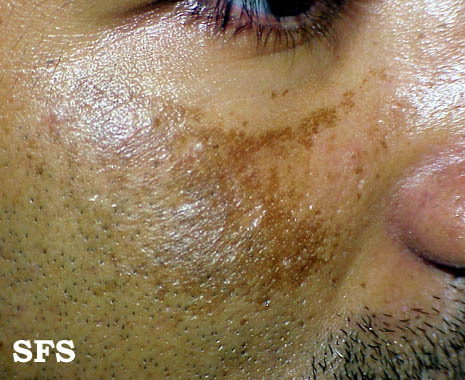 Melasma may affect men or women with none of the above known risk factors. There is a gradual development of hyperpigmentation (darkening of the skin) that arises symmetrically meaning it occurs on both sides. The dark patches are irregular in shape and more likely to occur on the cheeks, forehead, upper lip, chin and somtimes extends to the sides of the neck and shoulders. This pigmentation may present in one of three possible patterns – centrofacial (center of the face), malar (cheekbones) or mandibular (jaw). However, this does not preclude to the development of the patches on any site on the face but it is almost always symmetical (both sides). A Wood’s lamp highlights the pigmentation since it is arises in the epidermis (superficial layer of the skin). Combination of dark and light patches. Courtesy of Samuel Freire da Silva, M.D.